Identify Northern Screamer - Wildfowl Photography. Appearance: - The Northern Screamer has a grey crown with a tuft of grey feathers extending from the nape, a white throat extending to the cheeks, bare red skin from the brown eye to the small grey hooked beak, a black neck, blackish-grey breast, upperparts and flanks, slightly paler underparts, a black tail, there are two sharp spurs on the blackish-grey wings, and legs and partially webbed feet are pink. Both sexes are alike with the male usually being slightly larger. Size: - Typical Adult is 76-91cm (30-36in). Food: - Mainly vegetation - plants, leaves, roots, stems, seeds, grasses, and occasionally insects. 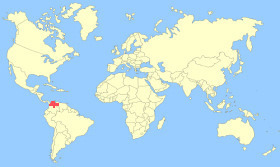 Habitat/Range: - Well-vegetated lakes, marshes, swamps, and lagoons in Northern Colombia, and north-western Venezuela. Breeding Season: - Eggs usually laid from October to November. Eggs: - 2-7 whitish to yellow coloured eggs. Notes: - The Northern Screamer is a good swimmer but prefers to be on land. They do not migrate but stay in the breeding grounds of Columbia, and Venezuela. 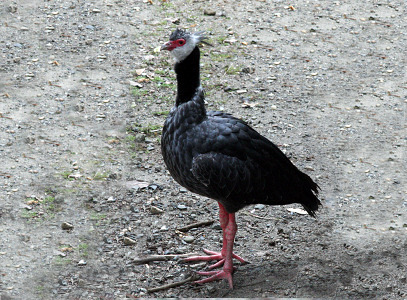 Northern Screamers, as their name suggests, have a very loud call which can be heard for miles. The Northern Screamer is classed as 'near-threatened' as it has a small and declining population due to loss of habitat.